Whisper Heat Line are the quietest units built and have increased efficiency and heat output. 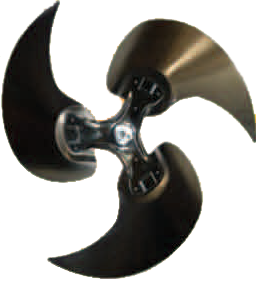 Whisper Heat models integrate an insulated sound barrier to reduce compressor noise and the unique "batwing" fan blade further reduces noise levels. Companies that have their products tested by credible industry accepted third parties receive the highest marks. Companies that publish high efficiency numbers but do not meet our standard of excellence will receive lower star ratings. When a product has a low rating, ask your representative why this low rating has been given. The Energy SuperMarket’s top selling brand, the AquaTherm Series consistently outsells all other manufacturers combined, and earns a 5 star plus rating in our Consumer Value guide! Does not affect the Ozone Layer! The AquaTherm TITANIUM Series – manufactured by Calorex, is designed to offer the highest possible overall cost effective operation and value - for the ultimate in swimming and spa comfort, with the added protection, durability, and value of Titanium!!!. Top-of-the-line design, construction, and performance are the hallmark of the TITANIUM Series, AquaTherm's premier line of swimming pool and spa heat pumps - a collection of heat pumps where all the optimum features available today - come as standard on the TITANIUM Series!!! • Lowest factory direct pricing available anywhere! Guaranteed. hundreds of dollars per year in heating costs! attributes is critical to assure total customer satisfaction. the Online System Sizing Guides directly below. • operation and pool heater sizing analysis. Cutting edge philosophy from the industry’s leading manufacturer! and deliver both at a price equal to or below other manufacturers! pool or hot spa at the lowest possible cost of operation. all other makes and models! 50%, plus an AquaTherm unit performs year round in warmer climates. the widest range of weather conditions. advanced design breakthroughs in efficiency of operation/performance. on the market that incorporates a Receiver Tank with its compressor. preventing damaging liquid refrigerant from backing up in the system. hassles, and makes enjoying your pool/spa combination a breeze! specifically designed to maximize surface contact of pool water - the most important factor in determining the efficiency of your heat pump. 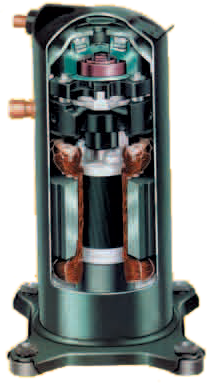 the largest scroll compressor ever offered for use in residential units. efficient compressors available on the market today. severe service and weather conditions. • thereby saving hundreds of dollars per year in pool heating costs! manage a basic unit change-out or new installation. For installations which require new electrical service, hiring an electrical contractor is recommended. How will a Heat Pump perform? 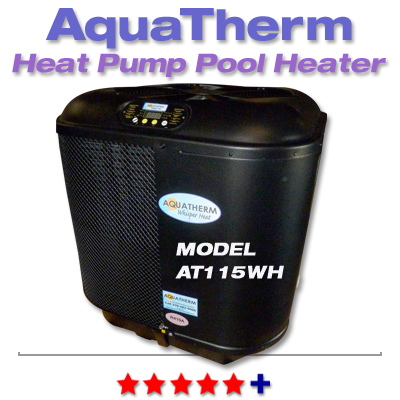 Sizing of a heat pump pool heater is based on the pool's surface area, geographic location, environmental conditions such as shading, wind, blanketing against night time heat losses, and more. Please complete, print and fax sizing form to 800-897-6527 and our engineers and consultants will prepare a free cost of operation and pool heater sizing analysis. Each model of heat pump can be installed by the handyman, although it is strongly recommended that the electric hookups be made by a professional contractor. It typically takes less than a day to have a heat pump installed and running. Installation manuals are included with each Heat Pump. B.T.U. [British Thermal Units] is the measured amount of heat output the unit will produce. The B.T.U. output will fluctuate with the outside air temperature and humidity levels. C.O.P. [Coefficient Of Performance] is the measured ratio of kilowatt usage compared to the kilowatt output. Aquatherm heat pumps produce between 6.3* and 5.4** kilowatts for every one kilowatt used to operate it, therefore every $1.00 spent in operation returns $6.30 to $5.40 worth of heat. The C.O.P. efficiency will fluctuate with outside air temperature and humidity levels. In 23 years of testing, Aquatherm has focused on obtaining the highest efficiency possible. A pool heat pump can be charged with refrigerant in such a way that will increase the BTU output at the "optimum" or "easy" weather conditions but, the efficiency [or cost of operation] will be sacrificed, especially in colder "tougher" weather conditions. A unit with a C.O.P. of 1 point less can cost 20+% more to operate than the Aquatherm. Operating efficiently during colder weather conditions is "where the rubber meets the road" so to speak. Aquatherm designs their heat pumps to obtain the maximum BTU, but only at the very highest efficiency possible in a wide range of weather conditions. The greatest value a heat pump provides a pool owner is to deliver a warm pool or hot spa at the lowest possible cost of operation. Product Claims: All product performance tests and claims are that of the manufacturer, not The Energy Supermarket. *Due to ongoing price changes, a quote is required at this time for the following states: AK, HI, MT, WY, DC. Delivery Unloading: Delivery truck driver will require handling assistance to be provided by purchaser when unloading unit from truck. Liftgate service available at an additional fee. Non returnable: All heat pumps are shipped directly from the factory and are non-returnable - all sales are final. Equipment Pad for Heat Pumps and AC units - Rigid Plastic Support Base. FREE Shipping when purchased with a heat pump.